First of all, it’s a relief simply to see that NASA has plans for missions in the next few decades, and because these missions are all detailed on NASA’s website, it means that it has to carry them out, right? In September, NASA will return focus to the moon before following up Curiosity’s atmospheric research on Mars. Then, the missions get particularly interesting. 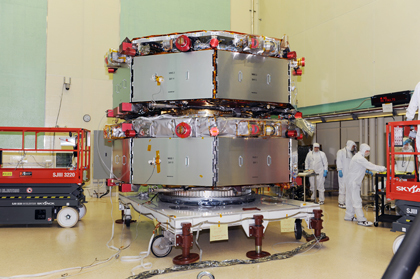 In 2014, NASA will undergo the Magnetospheric Multiscale Mission, which will send four identical spacecraft into orbit around Earth to measure and investigate aspects of its magnetosphere, including magnetic reconnection, energetic particle acceleration, and turbulence. The mission is designed to reveal the “dynamics of the geospace environment,” which among other things will help us better understand the “weather” in space. In 2015, the New Horizons spacecraft launched in 2006 will finally pass by Pluto and its moons. It’s currently over halfway there — you can follow its exact positioning here — having traveled more than 3 billion miles. New Horizon has already passed Jupiter and its moons, gathering images and information about this little-explored territory. It’s the fifth probe to have traveled so far, and will be the first to reach Pluto. I’m pretty psyched for New Horizons to land — I’m hoping aliens will meet the craft, ready to answer the question of whether Pluto is a planet or a glorified rock once and for all. 2016 will see the landing of solar-powered Juno on Jupiter. It’s got about 50 million miles yet to go, but has already covered 785 million miles since its 2011 launch, traveling at speeds of about 1.6 miles per second. Juno will uncover information not just about the giant planet, but also about the origins of the solar system. As we move toward 2030, the missions shift toward the exploration of asteroids. Companies such as Planetary Resources have already announced plans to mine asteroids, but NASA’s OSIRIS-REx mission will travel to Bennu, an asteroid near Earth, and harvest a sample for study. OSIRIS is set to launch in late 2016, will reach Bennu in 2018, and will return to Earth with the sample in 2023. In addition to gathering information about potential asteroid impacts, NASA hopes that the samples will provide information about little details such as the origin of the solar system and maybe even life itself. No pressure, OSIRIS. By 2025 NASA plans to initiate a manned mission to an asteroid. Building on information it will (hopefully) gather via OSIRIS and other missions, NASA may be able to start sending astronauts to asteroids even earlier than 2025. In an April 2010 speech, Obama mandated such a mission in preparation for the big-daddy mission: sending humans to Mars. Mashable’s infographic provides an optimistic glimpse at NASA’s possible future. Fingers crossed that lack of funding doesn’t relegate that future to the realm of science fiction. This is a sampling of the missions NASA’s Launch Services Program has upcoming and without doing research, it looks to be missions to planets or asteroids. There are also Earth and Solar missions as well as communication (TDRS). NASA LSP alone is launching 4-5 missions per year and nothing has changed. In addition, NASA has the Commercial Crew Program, which will use some of these same rockets to ferry Astronauts to and from the Space Station. And then SLS which is under development and manufacture, which is the replacement to the Shuttle and actually an expansion that will allow us to visit asteroids and Mars too. NASA is still here, and still active. This doesn’t even begin to touch on all of the other areas NASA is using R&D to advance our space faring capabilities.